Negotiation has been used since the stone ages, ever since we first figured out how to form coherent words. We negotiate everyday without even realizing we are, we bargain with each other all the time in order to get things done and cooperate with each other. If you’re intimidated by talking and negotiating with a seller, you have to remember that they are a person just like you and you’ve been having similar conversations your whole life. Think of a negotiation as two or more people trying to convince the other to give them whatever it is that they want. 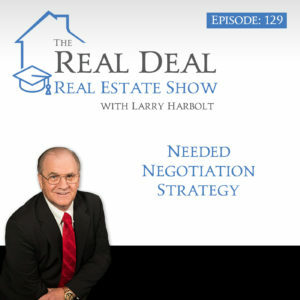 If you plan to be a successful real estate investor, being able to negotiate effectively is a must. You have to be able to talk to someone and get to know what they want, so you can offer them a solution that fits their needs. Finding motivated sellers is your number one priority, which is why the ability to communicate is so important. You have to get to know someone and identify if they are the kind of person that is worth your time and effort, and that means building rapport. You only learn when you’re listening so ask questions, and not just about the deal. You should connect with them on a human level before you start talking numbers. You will run into objections, but you have to understand that objections are not the end of the conversation. Too many people only know how to make one offer, but if you find out what they need you may be able to help provide that. Nobody likes rejection, but that’s what you are going to get when you are talking to people about buying their house. Overcoming objections by getting to the heart of the matter is crucial to your long term success.